Later today, do you fancy joining Eric Schmidt, chairman of Alphabet, for a fireside chat – while engaging in a record-breaking attempt? 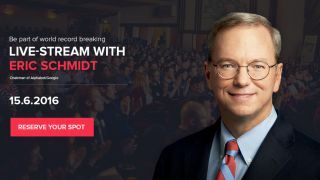 Well, you're in luck, as the Startup Grind Europe conference is holding a live streamed interview with the man himself at 16:10 UK time (8:10 PDT, 11:10 EDT over in the US). You can watch the live stream at this page and pop your details in the boxes provided if you want to be able to claim a certificate, should the record be successfully broken. What record is that, you ask? Well, this is actually an official Guinness World Record attempt, aiming for the largest audience ever for a live streamed conference. So if it comes off, you'll be a record breaker (dedication is all you need – well, a bit of punctual timekeeping… that and a decent internet connection). Eric Schmidt was the chief executive of Google over an entire decade, and now as chairman of the search giant's parent company, he advises the current leadership on business and policy issues. He can always be counted upon for some interesting and often controversial views. The live stream will run for around 30 minutes and at the end of that you might find you're an official world record holder; or at least part of a collective effort to that end.